The Thermo Scientific Precision 283 Heating Bath 2837 provides reliable use year after year sturdy construction and temperature uniformity. This 12L (3.17gal) lab bath is microprocessor controlled and can be easily set from the upfront digital control panel. The temperature range runs from ambient to 99.9ºC with a temperature uniformity of ±0.2°C at 37°C and its temperature sensitivity is ±0.1°C at 37°C. To help prevent thermal runaway this laboratory water bath has an automatic over temperature protection and over-temperature safety circuitry. The Thermo Scientific Precision 283 has a stainless interior, with a tray to act as a buffer to the heating elements, a corrosion resistant, powder coated exterior, and a gabled stainless steel lid. 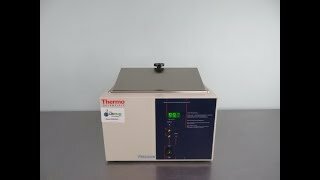 This Thermo Scientific Precision 2837 Heating Bath 283, 51221050 has been fully inspected and is performing to expectations. All of our lab equipment comes backed with our standard warranty. Should you have any questions, please don't hesitate to contact us.